Insects in the Backyard, the debut feature by indie filmmaker Tanwarin Sukhapisit, makes its local premiere on Saturday night as part of the World Film Festival of Bangkok. Having had its world premiere in the Dragons and Tigers competition at the Vancouver festival, the film is being touted as a "don't miss" by festival insiders. 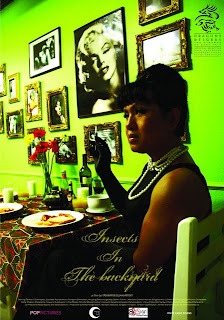 To call Tanwarin Sukhapisit's Insects in the Backyard unusual would be an understatement. The Thai drama ... tells the story of a transvestite father who lives with his teenage son and daughter. The father, after divorcing his wife and parading around in drag, refuses to be called Dad; to his children, he is Big Sister Tannia. "I've seen real-life cases in which katoey get married and have children, because that's the condition that society places on them, and I wonder what kind of domestic life they live," says Tanwarin, who's known to appear as a woman both in real life and in the movies he stars in. "The film tells the story of this katoey and his two children, who have a hard time trying to understand the behaviour of their father. This unusual situation also drives them out of their home to seek comfort elsewhere. I think this is the kind of story that hardly ever gets told." The Saturday night screening, at 7.30 at Paragon Cineplex, will have a Q&A afterward. There's also a trailer at YouTube. Have a look.